This is a Farmers Wife Origianl. Hello friends! Oh how I missed blogging! Really, I did, but I did need a break too. Sleep has been something I have been severely missing this last month, and I finally caught up just a little. But, even with my break I was still cooking! And boy do I have some yummy goodness to share with y'all!! 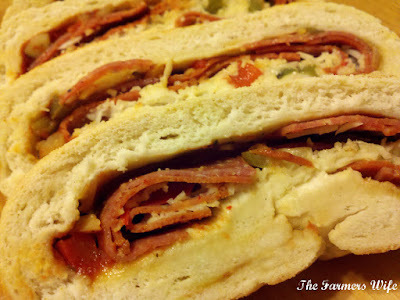 Now some may call this Stromboli, and yes it is very similar, but to me this was like eating a loaf of pizza! And come on, who doesn't love this idea? This was one of those recipes that was born out of necessity, you see I was going to make sausage bread, and I was really excited about it, then I go to cook the sausage and it smells like stinky feet. Like really stinky feet, ok I guess you didn't need to know that, moving on. But I already had the dough made and the peppers cooked so I had to do something. Well I had leftover Salami from when I made Hoagies, which was luckily still good. And I had turkey pepperoni in the freezer, and so out came this delightful treat! Now I have to say I'm excited about this one, because you could mix it up and make so many different variations on this, I honestly can't wait to give some of my other ideas a try! But for now I'll leave you with this last minute masterpiece! I hope you like it! Place ingredients for the dough in your bread machine, in order listed or as recommended by your machine. Set to dough and let it go. Once that is done roll out into a rectangle, about 15x8. In a pan, heat the olive oil and saute the onion, garlic, peppers and spices until soft and fragrant. Evenly spread the sauce onto the dough, and layer the salami and pepperoni on top of that, leaving about 1 in. on each side. Top with sauteed vegetables, and cheese. Then starting at one end roll up the bread until it forms a log, and then tuck the ends in on the bottom forming a loaf. With a little water on your hands, seal the edges all together. Pre heat the oven to 400F degrees. Place loaf on a baking sheet that has been greased with a little olive oil. Using a pastry brush, brush a little olive oil all over the loaf, and then sprinkle the top with a little garlic powder. Bake for about 15-20 minutes, until golden. Let it cool briefly and slice. This really is an easy meal, that was utterly delightful! Even the Farming Tot ended up eating some of it and liking it! This heats up really nicely either back in the oven for a bit, or in the microwave. We really, REALLY enjoyed this dinner, and happily ate the leftovers. And since this is so versatile you can literally put any filling you want in this dough! 4.5 Stars. This looks and sounds fantastic. I love bread! LOL Especially stuffed bread. This looks scrumptious and reminds me so much of Italian stromboli! Oh if this isn't the perfect combo of Awesome and Yummy!!! I really love and appreciate recipes like this because I am ALWAYS looking for good weeknight meals! Sorry about the stinky feet sausage..lol. But look what came out of it?!?! I'm looking forward to seeing your pizza sauce recipe!! Another great recipe girl!! Oh wow that is delicious!!! Love the use of salami on pizza... yummy recipe! Yum! Such a good idea Kim! Don't you find that often the best recipes come out of "luck"... like when you wanted to actually make something else and then came up with the tastiest treat?? I find that is often the case! Thanks everyone! Yes I agree, the best recipes sometimes come from fast thinking on your feet! This really was such a yummy dinner/late night snack... (I admit to nothing!! HA!) I'm glad you guys liked it! Yep... we call it Stromboli, but whatever it's called, it looks delicious. Who wouldn't love a pizza all wrapped up? Love the filling! Delicious!!! I love bread but pizza bread is the best!!! Awesome recipe! Oh my word! This looks scrumptious!!! Love it - stinky feet. What a terrific description. I'm glad you didn't use it in the bread, it looks amazing!